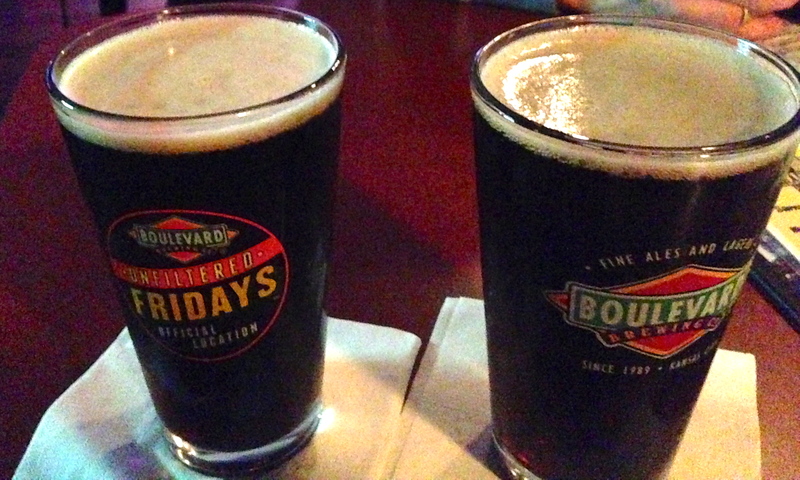 Date Night visits not one, not two, but three different establishments, all on the same date. It’s a whirlwind five-hour tour that starts Greek and ends with the blues. 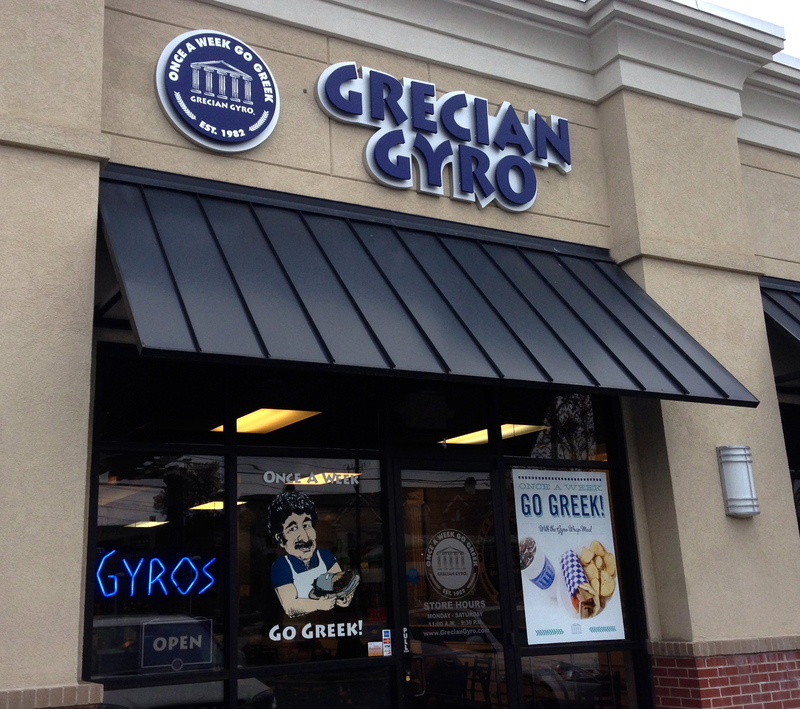 Our first stop, the Grecian Gyro in Dunwoody. Their slogan: once a week, go Greek. We are in the venerable Georgetown Shopping Center, which has been here for as long as I can remember. Grant and Marie Goggans, from Marie Let’s Eat, the number one restaurant blog in Atlanta, invite us to join them and their youngster Daniel for some Greek food. After the last few extensive, intensive, and expensive Date Nights, we need something cheap and easy (like the author of this blog entry). Grecian Gyro might do the trick. 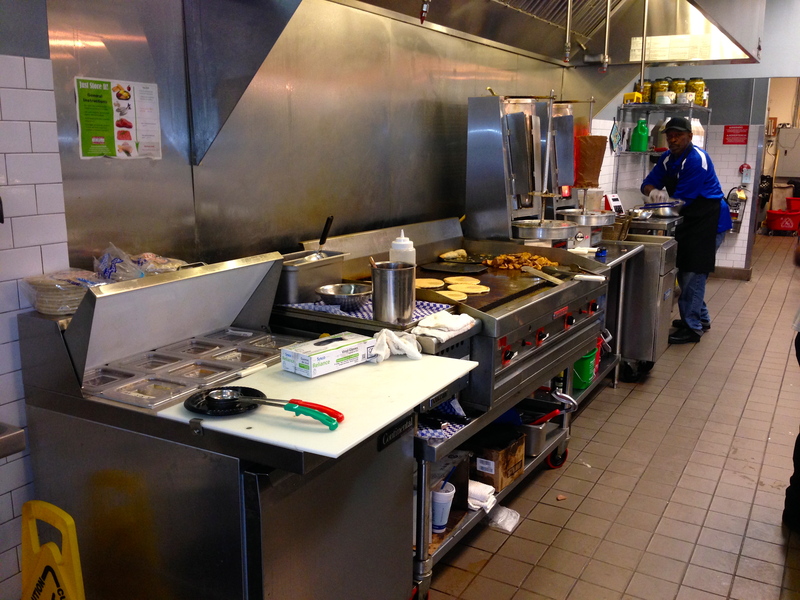 We order at the counter, which is right in front of the open kitchen. Our food is out before we get done pouring our water from the soda machine. They are fast here. We both get combo plates. Eve orders the side item plate, which comes with two sides and a salad. She dresses it up with spanakopita and an order of hummus and pita bread. The hummus is bland, which is not a bad thing for us. The pita is warm and fluffy. 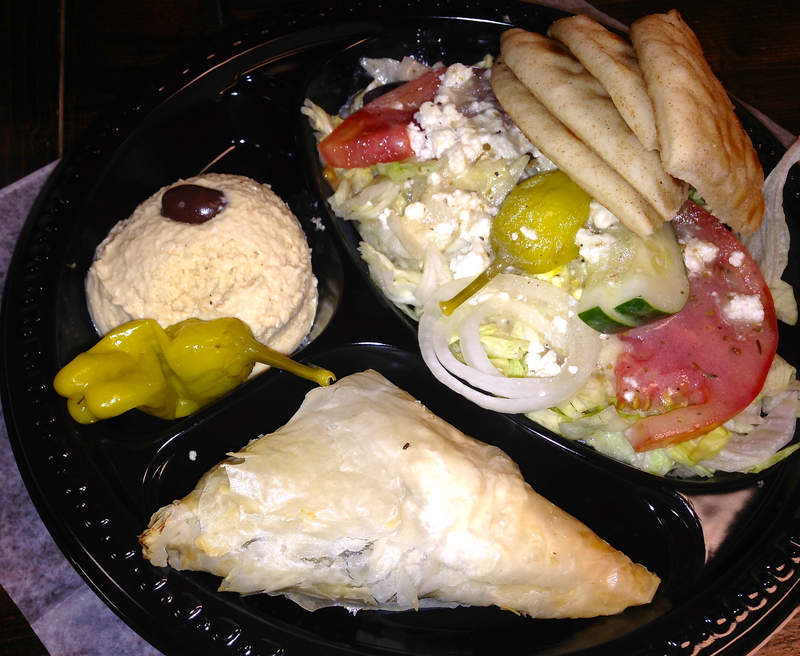 The spanakopita is the best thing we eat tonight. The shell is flaky and light and the spinach and feta filling is tasty, but she would have liked a little more stuffed into it. Here’s my combo plate. 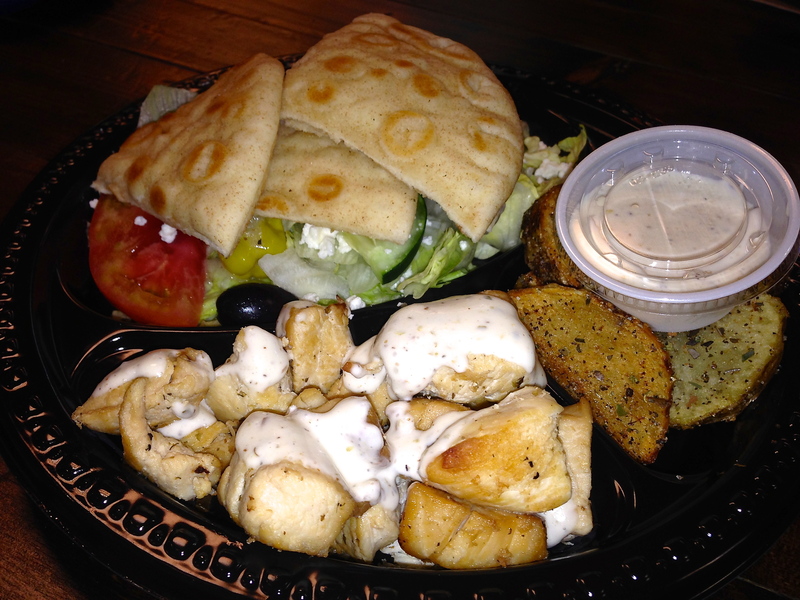 The chicken comes with salad, pita, and Greek potatoes. My chicken is dry and tastes like it’s been sitting on the grill for awhile. The potatoes and the pita are probably the best items on this plate. 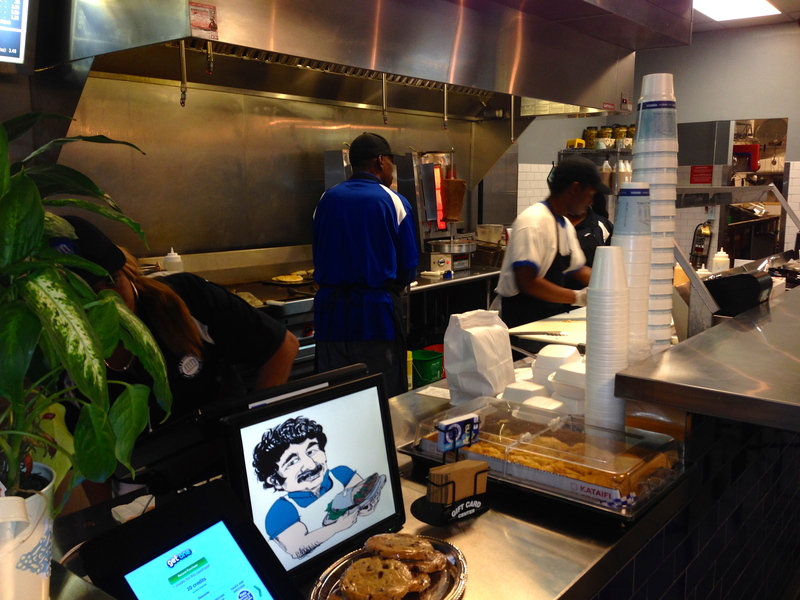 The Bottom Line on Grecian Gyro: Maybe a little too simple for Date Night. It’s more like fast food, Greek-style. There are five of them in the Atlanta area. Grecian Gyro might be a bit more suited for quick lunch if you need a Greek food fix. Probably not once a week, though. Across the parking lot from dinner is ice cream. 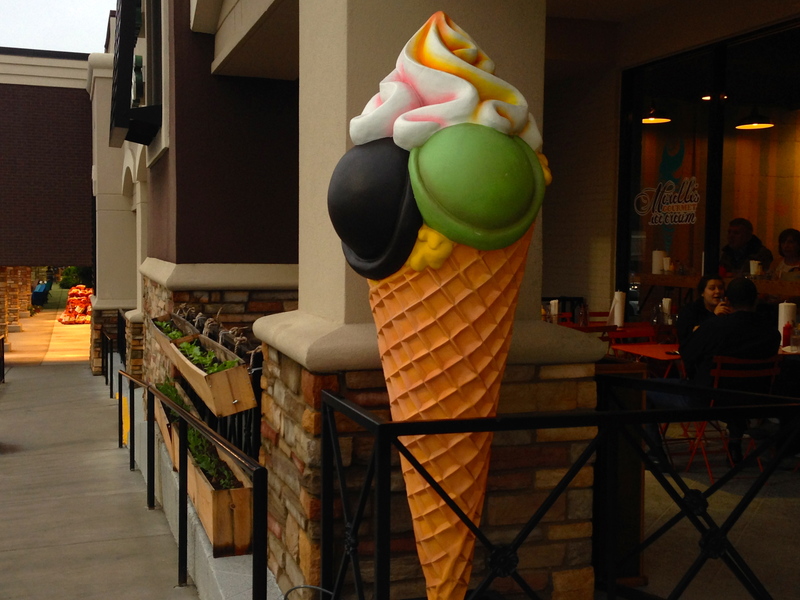 We don’t need an excuse to go for ice cream, and when Grant suggests Morelli’s for dessert, we quickly agree. 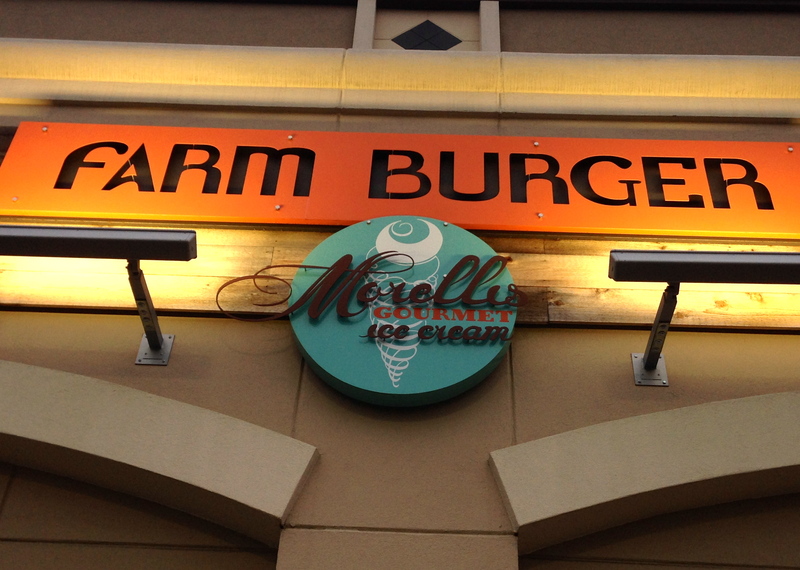 Morelli’s is located inside of the Dunwoody Farm Burger. We’ll get to Farm Burger on a future date, but for now, let’s see what we can try in the freezer cases. Eve chooses well, getting the Oreo and mint chocolate chip in a waffle cup. 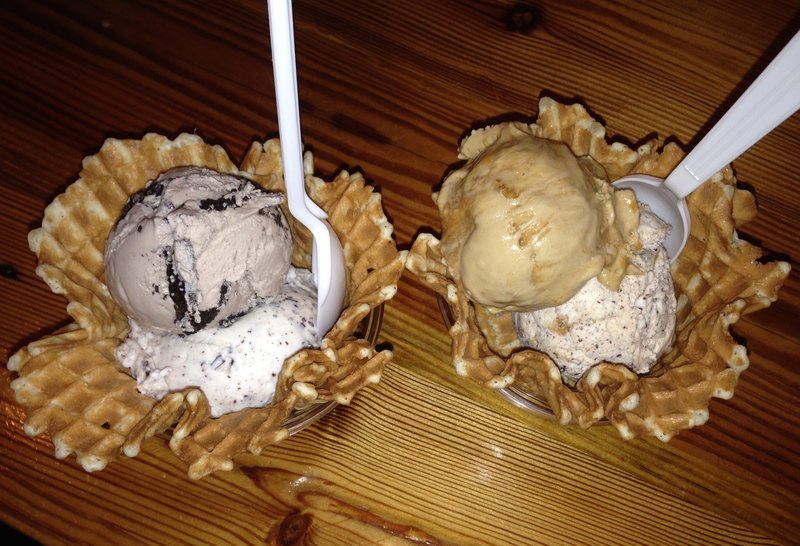 You can split a small into two scoops for more flavors. The mint is very strong, and note that there is no fake green coloring in it. I get what could be the best name for a scoop of ice cream ever, “Breakfast in Bed”. It’s coffee ice cream with caramel and pieces of Cinnamon Toast Crunch cereal. It’s really good with a strong coffee flavoring. I don’t drink coffee, but I love coffee ice cream. The Cinnamon Toast Crunch loses it’s crispiness in the ice cream and comes out a bit soggy. The crunchy cone bowl makes up for that. 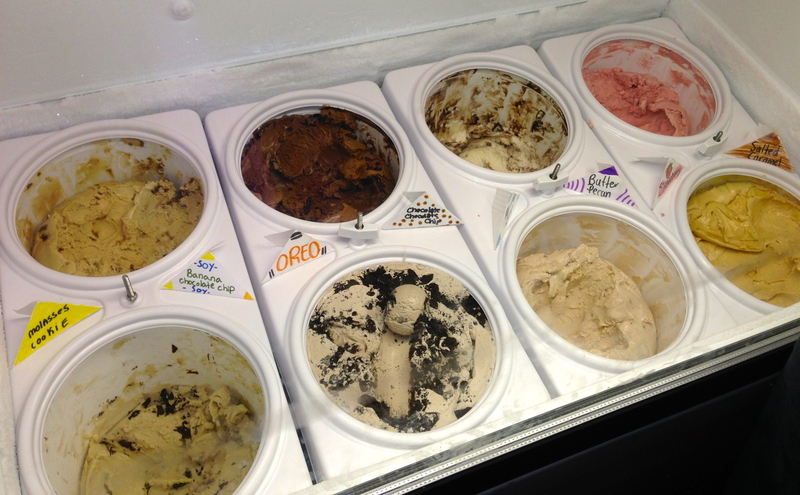 My other flavor is peanut butter cookie dough. It tastes just like a warm peanut butter cookie, yet it’s frozen. How do they do that? 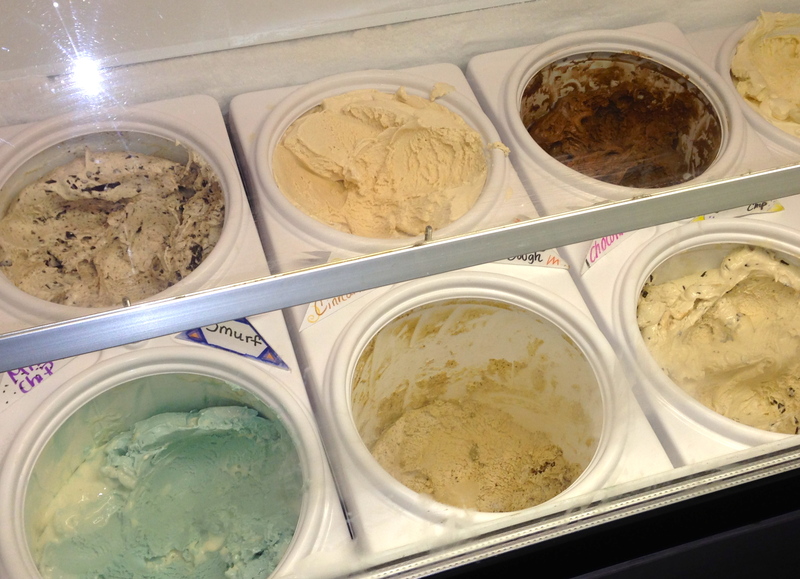 We need to do a Morelli’s vs. Jeni’s (read our review of Jeni’s here) comparison test. This would require many visits and lots of ice cream. Not a bad idea. Our regular readers probably notice that we haven’t had any beer on tonight’s date. We fix that on the way home at Darwin’s in Marietta. Our friend (and summer drummer in my band Exodus 5) Sandra Senn is celebrating her birthday by playing drums with the Leonard Blush Band. We pop in for the first set. Darwin’s is known for burgers, brews, booze and the blues, with bands playing three-chord shuffles there nightly. 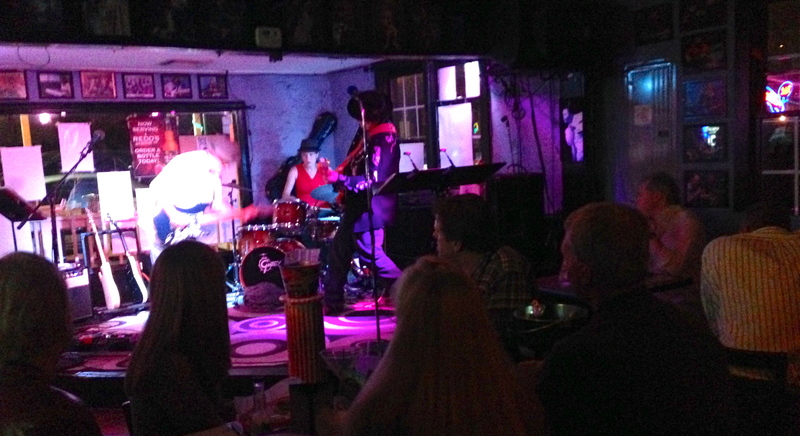 The band is cooking, the crowd is into it, and Darwin’s is rocking. It’s a fun place to go when you want to get the blues.